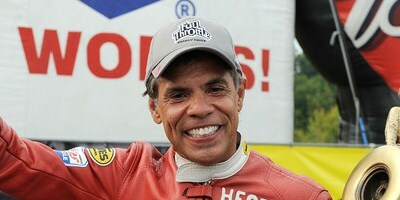 Lucas Oil Buell rider Hector Arana Sr. was caught in a rash of red-lights in the second round of the Auto-Plus NHRA Nationals on Sunday at Maple Grove Raceway. Arana, the No. 3 qualifier in Pro Stock Motorcycle, went red in his match with Eddie Krawiec, handing the round victory to the defending class champion. Arana is fourth in the Pro Stock Motorcycle points standings, with positions two through five separated by 16 points. Arana and son Hector Jr. each raced to the second round at Maple Grove, but son Adam lost to Krawiec in the first round. Arana, the 2009 Pro Stock Motorcycle champion, got to round two with a defeat of Joe DeSantis in the opening round. DeSantis, the No. 15 qualifier, left .050-second too soon to give Arana the immediate victory. Arana still made a full pull with a pass of 6.909 seconds at 193.88 mph that was the fifth-quickest of the session. Arana was one of three riders to red-light in the second round. Sovereign-Star Racing’s Michael Ray qualifies No. 1, Chaz Kennedy has Successful NHRA Debut at Reading, Pa.